Rural isolation is a root cause of poverty; connection is the foundation for opportunity. 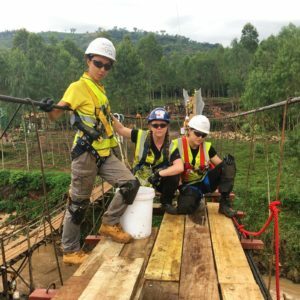 Through our industry partnership with Bridges to Prosperity (B2P), we have this year, teamed up once again with Tony Gee & Partners to each send five volunteers to build a much-needed bridge. 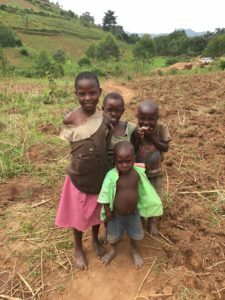 This year, the team travelled to eastern Uganda, for what was only B2P’s second project in the country. At 92 metres, it is by far the biggest of our bridge builds to date, and it is also the first ‘suspended’ bridge Knights Brown and Tony Gee have built together. This is our third bridge build. 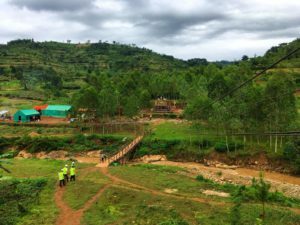 Footbridges connect remote communities to healthcare, education and economic opportunity, helping people free themselves from the poverty caused by rural isolation. Bridges transform the way people plan for and invest in their futures. Around the world almost 1 billion people don’t have safe access to critical resources like healthcare, education, or employment because of an impassable river. With this single innovation, all that changes impacting lives in multiple ways. When a community has year-round access to these resources, residents are freed to choose how they improve their lives for themselves. Aside from preparing themselves for the trip and the project itself, the volunteers must dedicate their energies to raising the funds they will need to cover the cost of their flights and in-country expenses (such as car hire, food and accommodation). Our teams like to do this collectively as it helps build a bond between them that is invaluable when it comes to hitting the ground running when they arrive in country. 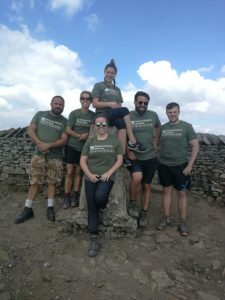 The team’s main fundraising activity was the Yorkshire 3 Peaks, which was undertaken during sweltering conditions in July. 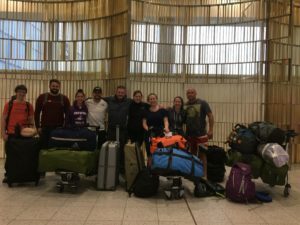 The money raised, when combined with a £1,000 ICE Quest Travel Award, and swelled by contributions from smaller events including a chilli hot-dog drive, helped them get within a whisker of their £15,000 target. 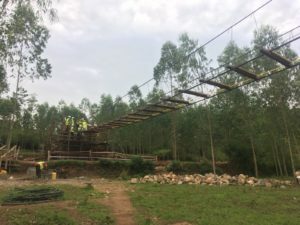 With it being such a big bridge, B2P’s representatives worked very hard prior to our team’s arrival, liaising with local government and the community to plan and prepare. Mobilisation work began towards the end of June and the bridge began taking shape, with the foundations, tiers and ramp walls completed, reinforced concrete anchors cast and fixed, and the main cable hung. When our team arrived on site in August, their tasks were to hoist the handrail and walkway cables, build the back wall and left-hand ramp wall and backfill, assemble the swings and install the decking and fencing. All in just 10 days. The following is a unique insight from one of our volunteers describing his personal experience. Lee: “I thoroughly enjoyed this trip and was very, very glad that I took the plunge and volunteered. It has been a long-time goal of mine to do something like this and the fact that Knights Brown supports this very worthy charity, both financially and by allowing their employees to take paid leave to do so, was a major part of my being able to afford to do so. It was quite a journey to get to the bridge site and our accommodation. 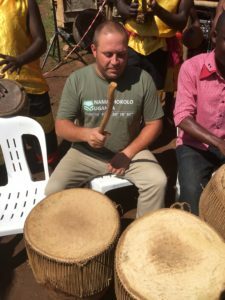 Having set off at midday on Friday 24 August by train to Gatwick, we finally arrived at our homestay on the Sunday evening, after a brief stopover in Kampala to gather supplies. Preparations by the in-country team (led by James and Erica), were all in place and the advice received from them throughout the trip was invaluable. The accommodation, whilst basic, had a bed with a mosquito net that was clean and functional. To its credit, and one of the main reasons the team chose to stay here, was that the property also benefitted from having four of the only flushing toilets in the region plus two pit latrines. As well as this (whilst somewhat intermittent) there was also running water drawn from a variety of sources, including a well, a stream and harvesting rainwater from the roof. The Zaales family, who own it, were very welcoming, explaining on arrival that this was a ‘homestay’ not a hotel and that we should consider ourselves part of the family during our stay. Every morning and every evening, hot food was prepared. The family went to every effort to ensure that we all had something that we liked every day. Sometime towards the end of week one, French fries were brought out. These went down particularly well and became a staple part of the daily diet, along with the matooke (green bananas), posho (maize mash), mashed or roasted potatoes and of course the rice and beans. Some days some meat was also available. Breakfast included bananas, coffee and chapattis, which were always good, plus boiled egg or omelettes. Occasionally we were treated to “Rolex” derived from “rolled eggs” whereby scrambled egg/omelette was rolled up inside a chapatti. It is truly a delight I would highly recommend! On first arriving at the bridge site, I was keen to see what this formidable river would look like. I was surprised to see only a small, very muddy river, which I later found (swimming a bit upstream of the site) to be incredibly powerful. Around a week into the build, we had a couple of days rain and the river swelled almost immediately to double its size. We later also found out, and this could be seen from the erosion stepping, that the entire campsite and construction area would also become flooded in the rainy season. The benefits the new bridge would bring suddenly became much more apparent. 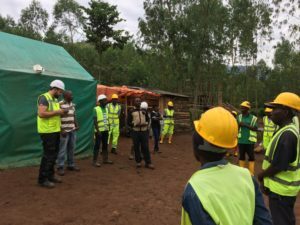 Having met with the site team programme manager, Samuel, and site ‘forepersons’, Boss and Annette, and after being introduced to the local workers, we began with stretch and bends. Initially, this felt very “American” but soon became the norm and served to ease our tired muscles each day ready for the work ahead. Stretch and bends was followed each day with a site briefing in English and local dialects of the planned activities ahead. We were separated into teams and began with construction of the hangers and drilling of the planks, whilst others went to set the cables to the required levels. Work was hard, but I was pleased that I was able to keep up with the youngsters on many things and to my surprise, even found that I was able to better them on some tasks, particularly those requiring less aerobic capacity and more upper body strength, such as the bar bending. To pass the time, preparing the 182 hangers required, we made a competition of who could bend the fastest whilst still maintaining quality control, strictly enforced by Ailish! I was really impressed with the whole of our team throughout, with everyone putting in really hard graft every day. Morale was kept high with silly games, songs and bad jokes and all the way through there was never a point when anyone cracked and gave up or lost sight of the positive contribution that we had come there with the intention of making. 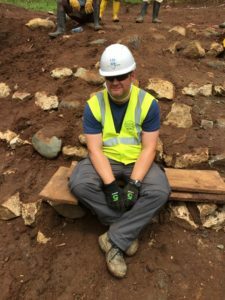 B2P’s construction logistics manager, James, led by example throughout and we were joined by one of the bridge designers, Nico, whose sense of humour and experience building bridges in Nicaragua for seven months, was also of great benefit. With good weather on our side, progress during the first week went very well and we were able to have a welcome two-day weekend to enjoy the local surroundings, taking in a hike in the mountains and a day at a nearby hotel with pool. This did mean that the last few days on site were a real slog and, by the end, we were all well and truly ‘broken’. I take my hat off to the B2P team who will start again less than a month later, this time with two concurrent bridge builds…. 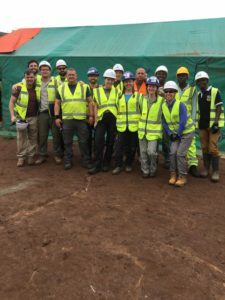 The B2P team were professional and engaging, helping us to integrate seamlessly with the local workforce and as a team we all worked well together. Several of the “apprentices” working with the B2P team spoke very good English and having worked together on the last bridge, were able to give direction whenever we got stuck. Every evening after work we returned to the homestay, where if there was no running water, the family had boiled bucket after bucket of hot water for us to have bucket showers. Sometimes this was even nicer than a luke-warm running shower. The owners son, had a deal with the local pub and a few beers were always on hand to help us wind down, ready for the next day. Although I don’t think any of us had any trouble sleeping, falling asleep the moment our heads hit the pillow. Routine ensued. Up at 6am every day, ablutions, breakfast and a 45-minute journey to site, followed by a hard day’s graft. There was an hour of rain around 12-1, but this dried out within an hour and it was back to work ‘til sunset or sometimes a little before. This was followed by the 45-minute return journey to the hostel, to wash, eat, relax and go to bed, ready for the next day. After a few days, some of us became brave enough to accept the family’s invitation to join them in their home and take part in dancing to local tribal songs. Bravado steadily increased with more of the team becoming curious to be involved. Soon we had half the team in the living room dancing the night away. Every day on our journeys to and from the site, there were beautiful sunrises and sunsets. Children would be waiting outside their homes in the morning to cheer us past, shouting “Mzungu byeee”, only to be there again in the evening to catch us on the way back, making us feel like rock stars. A pair of Crested Cranes (the national bird of Uganda, which features on the national flag) were to be seen at the same place every morning. The locals were very friendly, with beaming smiles and it was a benefit that while the local language was tribal, the official government language was English, which most people spoke fairly well. During the period of our stay, across the region, different provinces held successive circumcision ceremonies. This is an important milestone in nearly every young Ugandan man’s life, heralding his arrival into manhood. As part of the ceremony, for the weeks and days leading up to it, processions of people (ranging from as few as five or 10, up to more than 200) marched and ran through the streets and countryside, chanting and shouting and dancing. 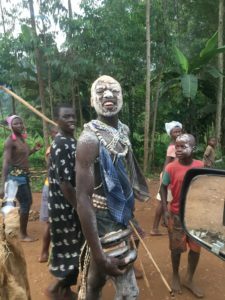 Many times, they were covered in mud or white paint, carrying sticks or machetes. This was quite daunting the first time we saw it but after a while, although still spectacular, it became commonplace. I was totally shattered by the time I came home and felt like I could have done with a holiday to get over it. However, I thoroughly enjoyed the whole experience and would highly recommend it, though for myself, I might wait a couple of years before thinking of doing it again, and even then, might have to think twice! Below is a selection of images from throughout the build. There are also some video clips in our film archive including the inaugural bridge crossing and John teaching local children how to do “The Floss” dance.